au Mau's '3 Monkeys' stare at me while I walk along Division Street, they dare me to explore the seemingly harmless depiction of a primate trio. According to Vertical Gallery, "Mau Mau is a renowned British urban graffiti artist who’s gained an international following with his humorous street, print and graffiti work." His calling card is a menacing fox that always appears alongside his creations and he has worked for establishments like Ninja Tunes, Greenpeace and Glastonbury Music Festival. Before we dive into analysis, let us provide ourselves with the proper lens. One should be thinking of Dr. Jane Goodall's work with chimpanzees before approaching this piece. During a recent episode of Deepak Chopra's podcast 'Infinite Potential' Goodall mentioned that her first interaction with a chimp consisted of the primate rejecting a banana and proceeding to squeeze the good doctor's finger to show her that her offer was appreciated. This should stir feelings of awe considering many people believe that only humans bear complex consciousness and after all these creatures are our ancestors. One should also consider the Rastafarian term 'Concrete Jungle' because we are essentially operating within this socio-political landscape of modernity with animal-type brains that still utilize 'fight or flight' mechanisms and other odd functions. Lastly, we should consider the ideas like materialism, technology and modern methods of time spending. Now for analysis. 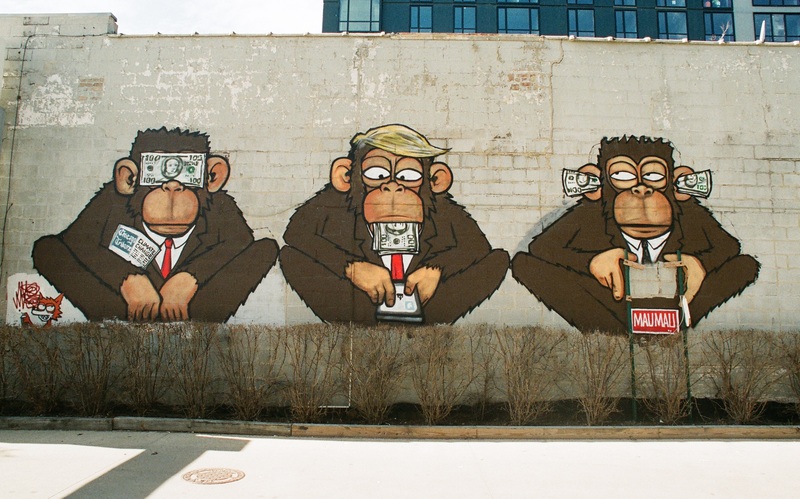 The monkey on the far left is unable to see, a 100 dollar bill blocks his vision. Could this be speaking to the public masses who blindly accrue cash dollars without considering serious issue like 'Climate Change', which is the headline of this monkey's newspaper? Maybe.. The central monkey has 100 dollar bills in his mouth and scrolls on a smartphone. The blonde hair and twitter emblem could suggest that this monkey is our infamous President that shan't be named. Oddly the blonde hair has faded out! Lastly, the monkey on the far right side has his 100 dollar bills in his ears and he looks rather annoyed. See no evil, Speak no evil, Hear no evil. Are we evolving if we destory our planet? Are we the only thinking creature on this blue dot.